I was super excited when travelling to Taiwan was made easier for Filipinos. I was dreaming of strolling the streets in search for the "must-try" street foods and dishes. But the plan of having a food trip didn't push through and I said to myself I'll probably get lucky next year. If there's a place in the metro I frequent the most, it's the Bonifacio Global City. It feels like BGC has everything I like and need. 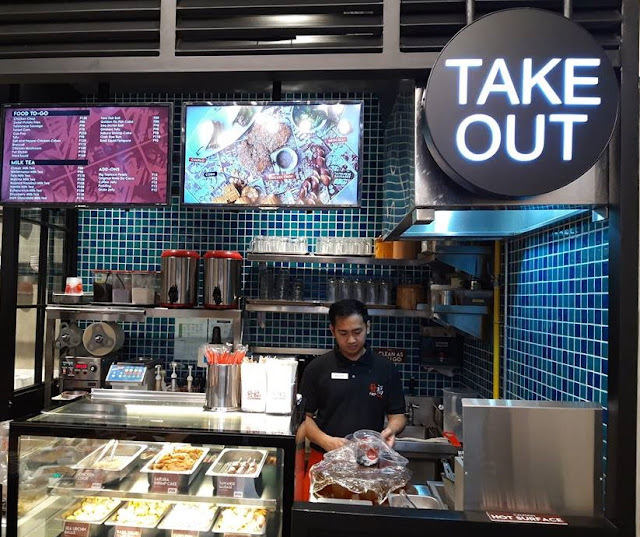 And it seems like the BGC universe has heard my heart's desire because Fat Fook, the fast growing Taiwanese restaurant chain, has opened a branch at The Globe Tower BGC. The Instagram-worthy facade of Fat Fook at The Globe Tower will make you wonder for a second if you are in Taiwan. The blue and white porcelain bowls and plates aesthetically provide privacy for the diners. The interior exudes a cozy and friendly vibe that makes dining an enjoyable experience. 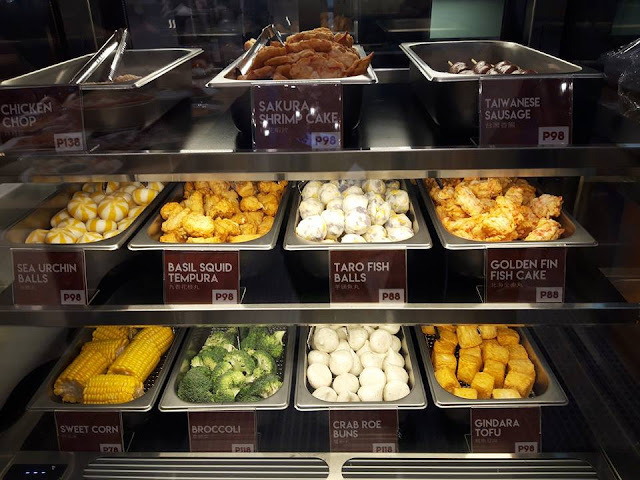 Honestly, the only authentic Taiwanese dishes I know are stinky tofu which I am very curious to smell and taste and the Taiwanese sausage I have tasted in a buffet but I'm not convinced if I have eaten the real thing. You ask me, how authentic are the dishes served at Fat Fook? 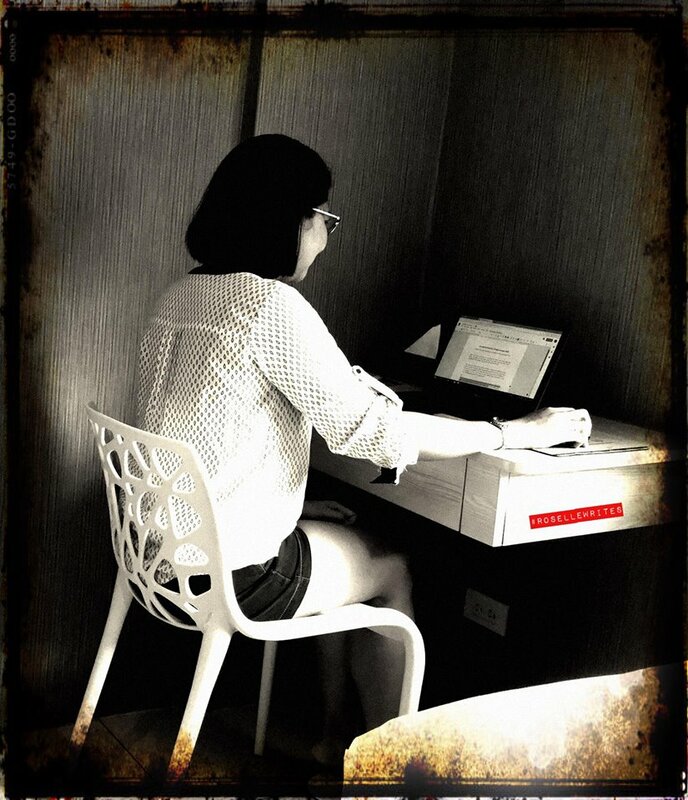 Well, this Taiwanese restaurant is conceptualize by executive chef Rachel Kao who was born in Taiwan. Fat Fook first served its authentic Taiwanese dishes in 2016. The Fat Fook at The Globe Tower is the 5th branch in the Philippines. Fat Fook means big blessing or fat luck. I guess I was just been blessed because I was invited at the media launch and the experience was somewhat close to what I have imagined had my trip pushed through. The recipes are passed on by Chef Rachel's parents and made even better for Fat Fook. 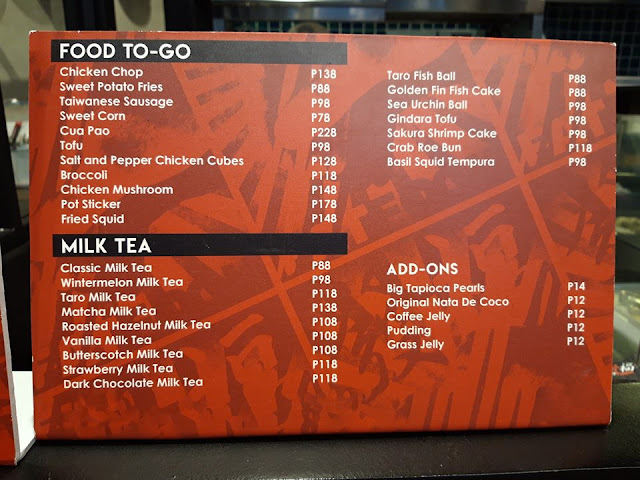 While some of the dishes has been adjusted to suite the Filipino palate, it's the closest you can have from the Taiwanese version because the ingredients are sourced in Taiwan. The fried Stinky Tofu got me excited the most. They say you should never miss the chance of eating this when in Taiwan. Of course I would mind tasting this first in the Philippines. 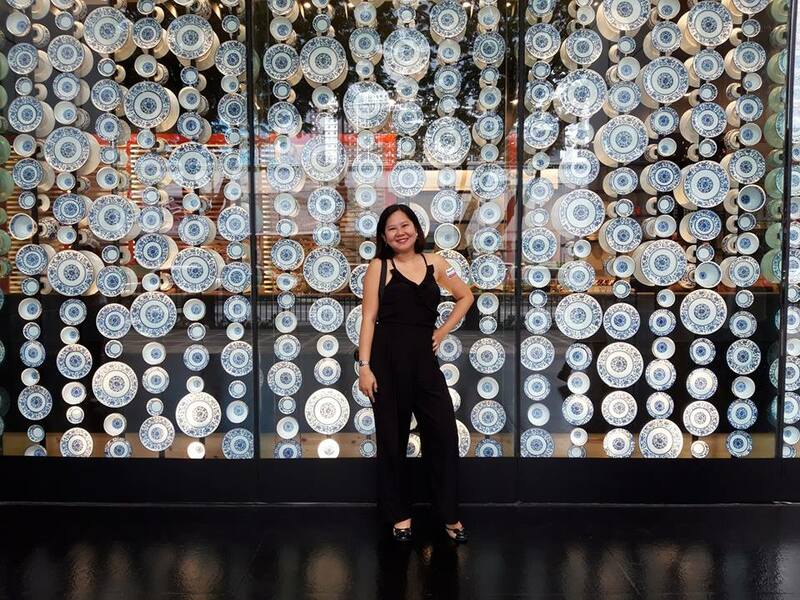 Chef Rachel made sure that you will be having exactly how it is served in Taiwan. 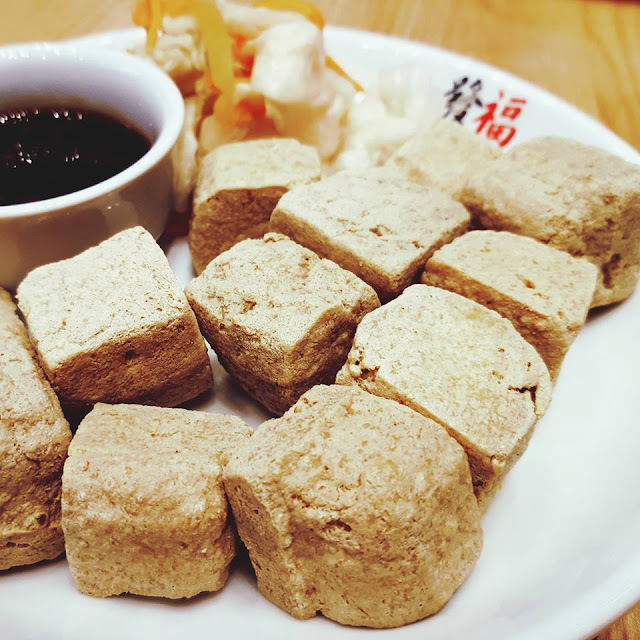 According to Chef Rachel, in order for you to fully enjoy the burst of flavor of the stinky tofu you must dip it and eat together with the pickled vegetable side dish. 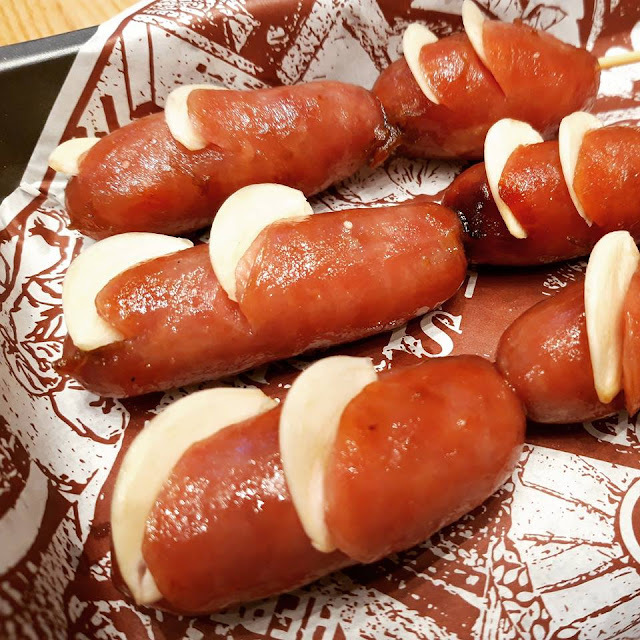 The Taiwanese Sausage tasted way better than what I had before. This will definitely capture the taste buds of the Filipinos. It is sweet, tasty and juicy. These sausages are pan fried and garnished with fresh garlic slivers for more flavor. The Tofu with Century Egg and Pork Floss is perfect to whet your appetite. 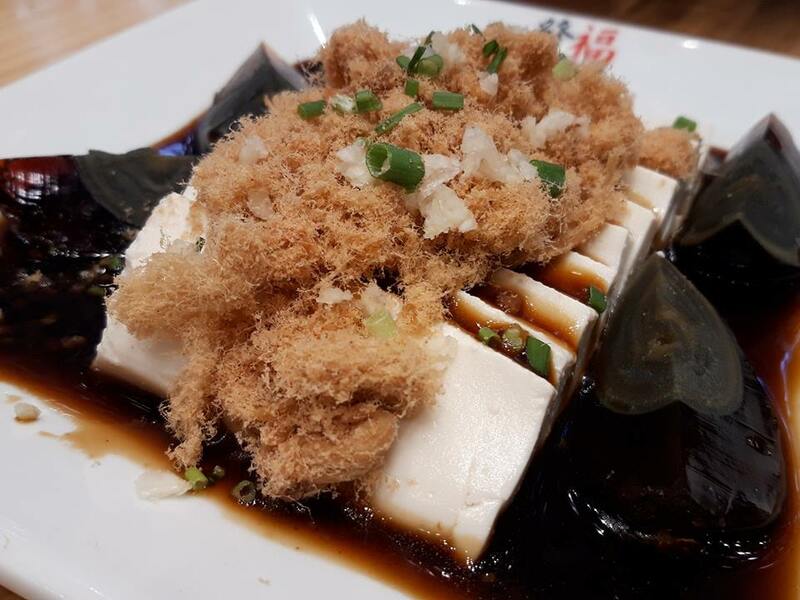 The silky texture of the tofu complements the pork floss and the marriage of flavors of the century egg and the sauce will make you look forward to the next dish. 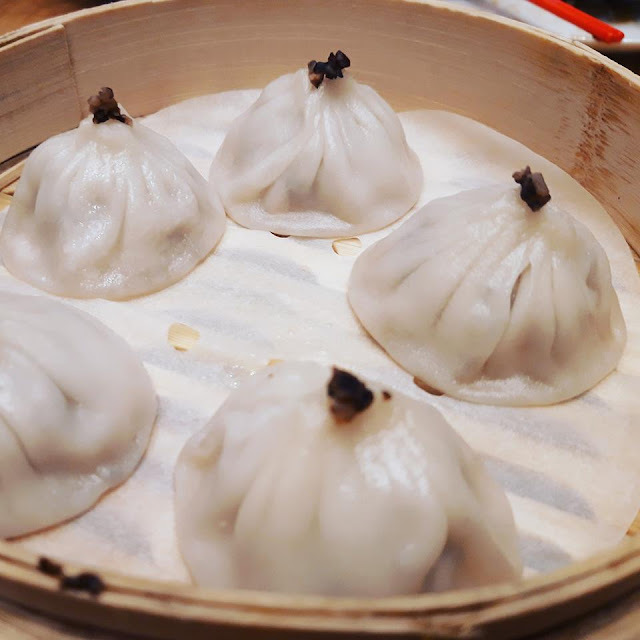 Xia Long Bao has become famous recently in the Philippines and I've seen Chinese restaurants showcasing their versions. 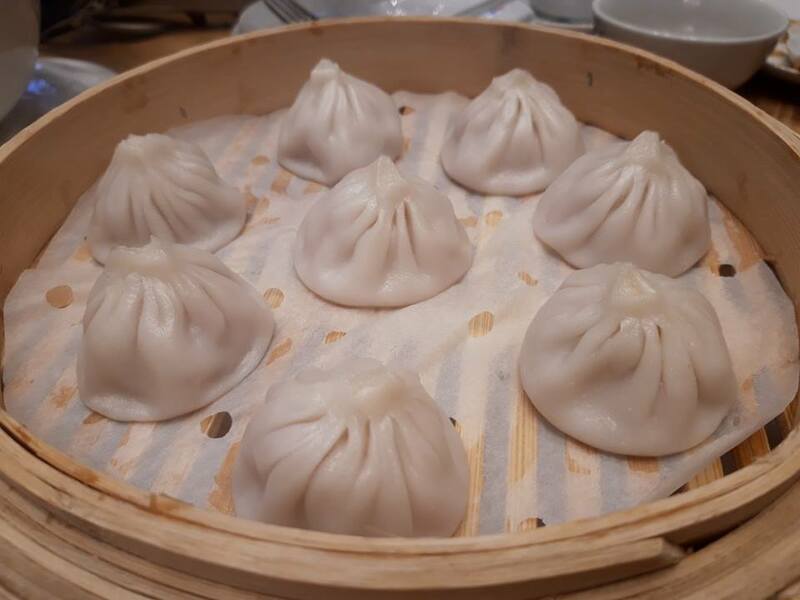 It was my first time to try Xia Long Bao and what made it extra special was I got to sample the truffle variant. Xia Long Bao is a soup dumpling so you have to be extra careful when picking it up with the chopstick. Fat Fook's bestseller is the Pork Xiao Long Bao. It is best served with black vinegar and ginger dip. With the truffle variant, I suggest you skip the dip and simply savor the truffle flavor. New on the menu is the Spicy Wanton. It might be a bit too spicy for others but the trick is to consume this with Fat Fook's Milk Tea. 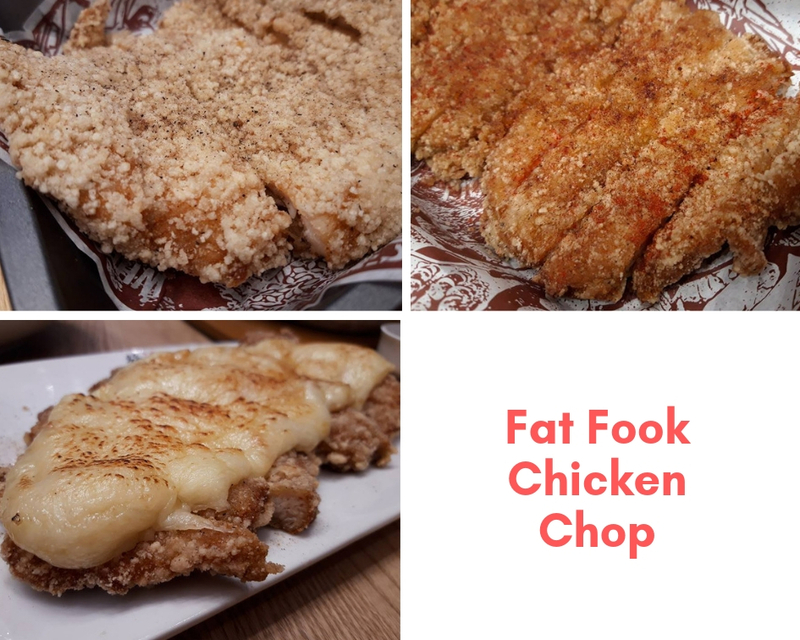 One of Fat Fook's signature dishes is the Chicken Chop. The breaded chicken fillet seasoned with salt and pepper is deep fried to perfection giving the dish a crunch with every bite without compromising the juiciness of the meat. New on the menu is the Cheesy Chicken Chop and the Spicy Chicken Chop. Fat Fook has an extensive menu. 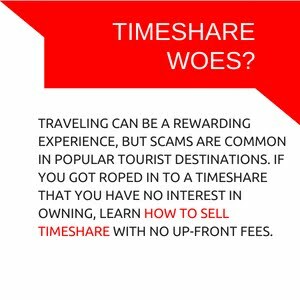 You must come prepared in order to sample every dish that catches your gastronomic fancy or come back some other day for more. 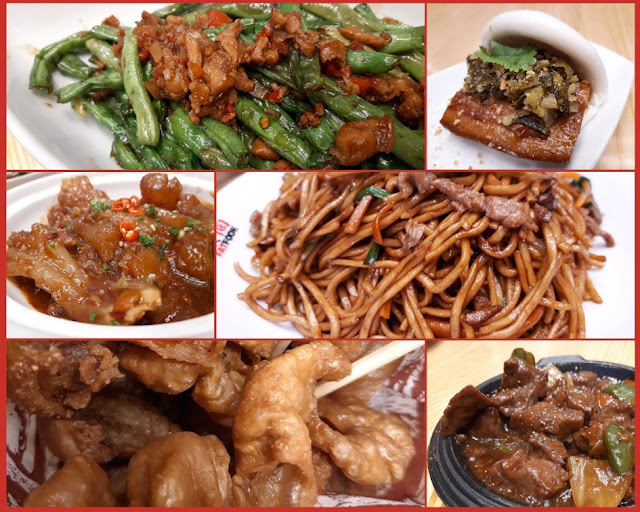 Other dishes to try are String Beans with Minced Pork, Cua Pao, Beef Tendon Hotpot, Taiwanese-style Fried Noodles, Fried Intestine, and Black Pepper Beef. Lunch time can get busy and the 40-seater Fat Fook restaurant is definitely full of hungry diners. Worry not because they have a take out counter for you to still satisfy your craving. This is perfect for me because I frequent BGC for staycation and take out food is my lifesaver. The Chicken Chop, Taiwanese Sausage and Cua Pao are in the food to-go menu! And yeah, you should not forget to pair your food with milk tea. 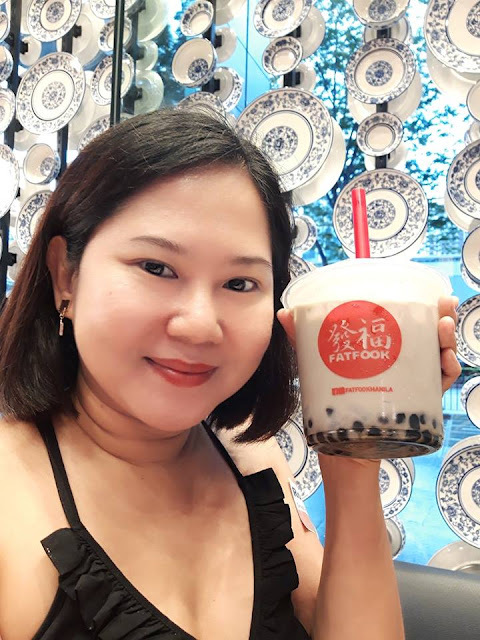 I had the Taro Milk Tea with big tapioca pearls and original nata de coco. I wanna try the coffee jelly (my favorite sinker!) next time with either Roasted Hazelnut or the Dark Chocolate milk tea. Fat Fook at The Globe Tower is open every day from 11am to 10pm. 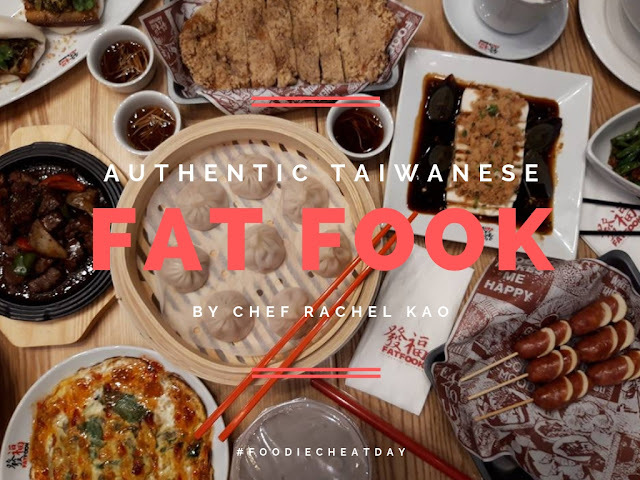 For more information, follow @FatFookManila on Facebook and Instagram. 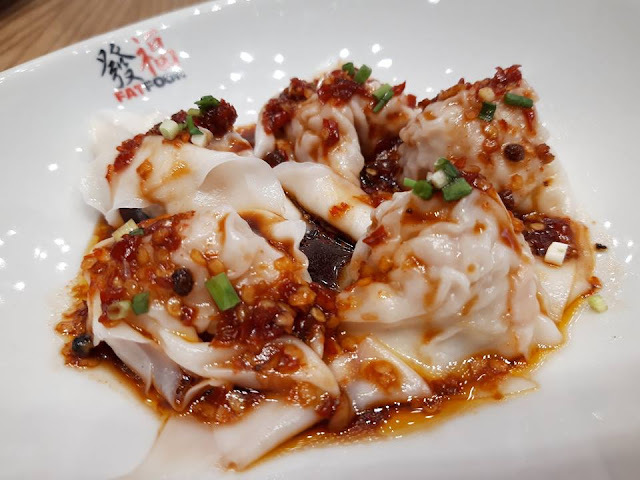 I'm feeling a bit generous and would love to let you have a taste of the dishes I've tried at Fat Fook. Make sure you follow my food instagram @FoodieCheatDay for more food photos and my blog instagram @MsRoselleWrites and like my Facebook page @MsRoselleWrites. I'll be posting the mechanics there soon on how you will get a chance to win P1,000 Fat Fook gift certificate. wow luscious foods, lahat like na like..